How is it possible that Mother’s Day is this weekend?? I feel like we just got done with snow. I know we had Easter in there somewhere but time is whipping by at an alarming rate lately. 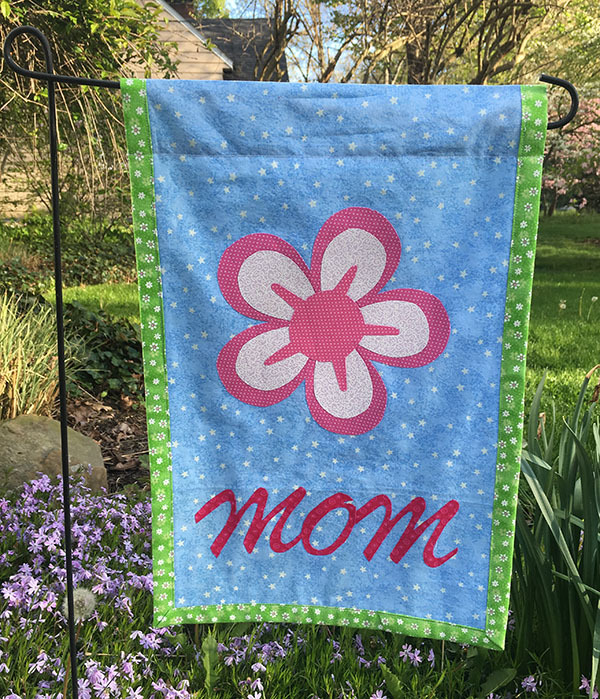 I wanted to make a little something in honor of all the awesome Mamas out there, and since I am also an awesome (but crazy busy) Mama, I wanted a quick project. A cute little garden flag. Just a few pieces to cut out, just a few seams to sew, done in an evening. Perfect! Cut a 12-1/2” x 21-1/2” rectangle from the flag fabric. Fold down one short edge of the flag fabric and press. 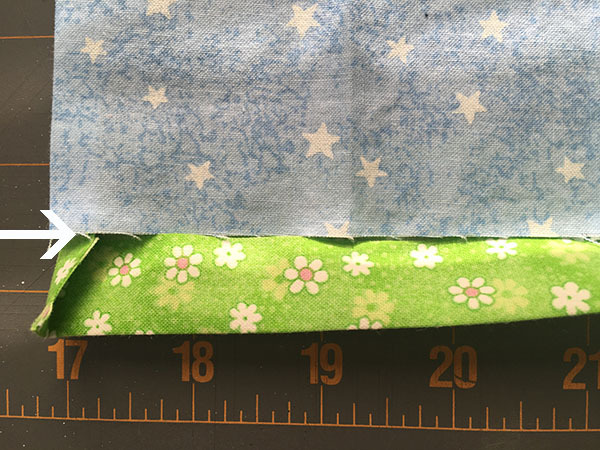 Measure down 4” from the folded edge you just created and draw a line across the fabric on the wrong side. 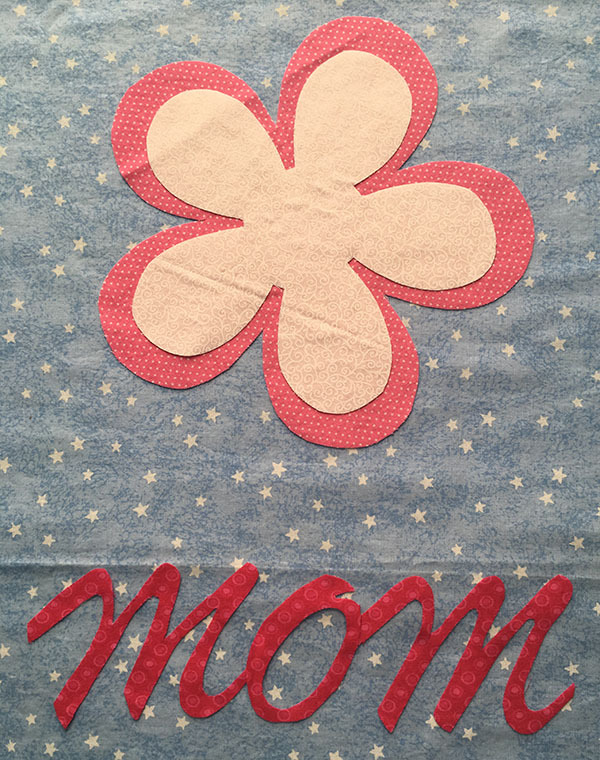 Download the pattern for the flower pieces and “Mom” script and print them out at 100%. Trace the patterns onto your fabric adhesive and apply it to the wrong side of your fabric adhesive following the manufacturer’s instructions. Cut out all the pieces. The script can be fiddly to cut. I used really sharp embroidery scissors and went veeeery slowly. I connected my letters so they made one continuous piece rather than three separate letters, like cursive. 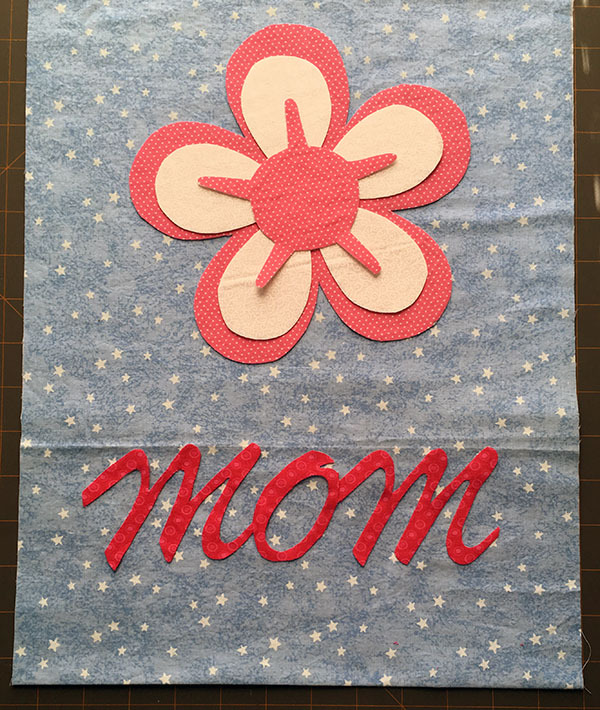 With the flag right side up, measure up 2” from the bottom fold and center the “Mom” script on this line. Layer the flower pieces together and center them above the script. 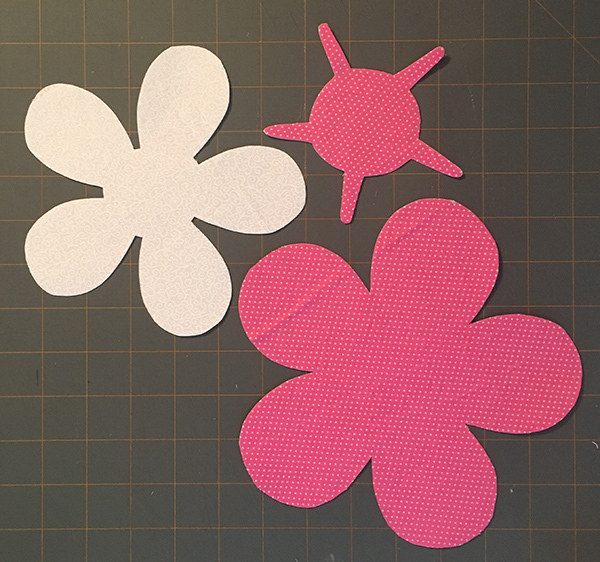 On mine, the outer flower is 2-1/4” from each edge. Iron all the pieces in place following the manufacturer’s instructions. At this point, you could zig zag or satin stitch around all the pieces with matching thread to make them more secure. I don’t plan to use my flag outside for more than a few days, so I didn’t bother with this step. 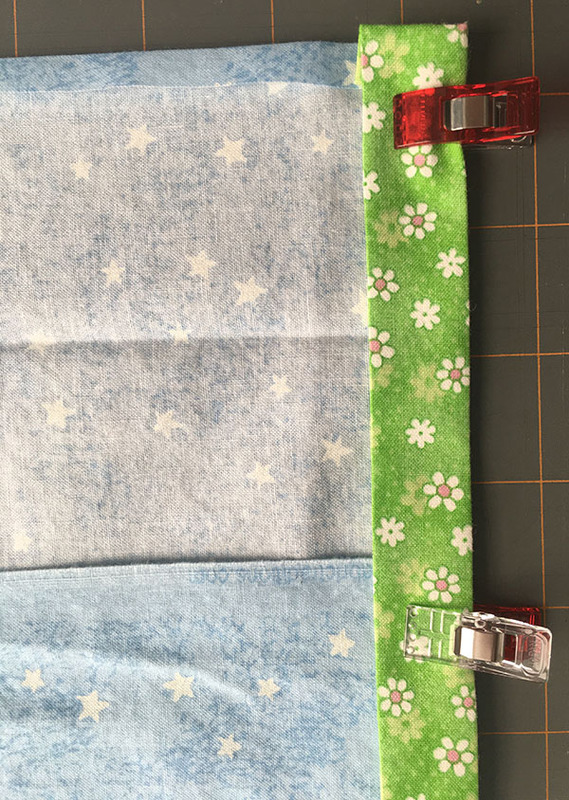 Cut 3” strips from the fabric you’re going to use for your binding. Fold each strip in half, right sides together and matching the long sides. Press to mark a center line. Open the strips up and fold each of the long raw edges to the center, and press again. Fold the whole thing in half along the original center line and press one more time. You should have long narrow strips with all the raw edges folded to the center. 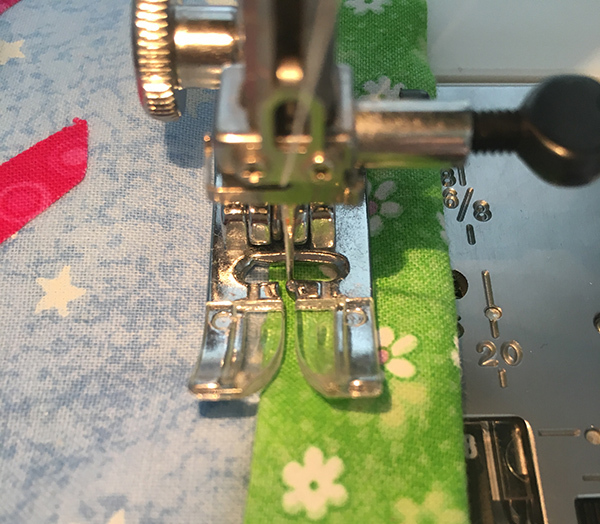 Fold down the short edge of one strip ½”. 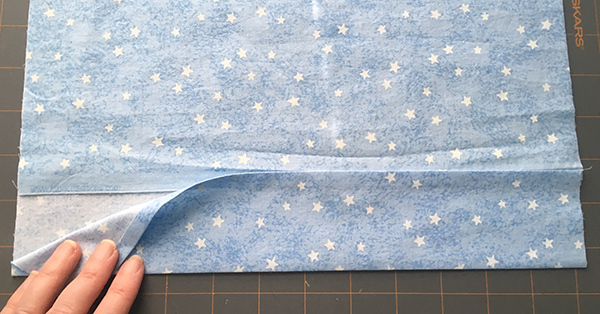 Starting at the top of the flag, slide the edge of the flag into the binding, making sure the raw edge of the flag is sandwiched in between and pushed all the way to the center fold of the binding. Pin the binding down one side, across the bottom and back up the other side, and fold the raw edge of the binding under at the top. Stitch around the binding 1/8” from the edge. Lay the flag on your work table with the back facing up. Fold the top edge down until it covers the raw edge of the back by about 1/4" and pin in place. 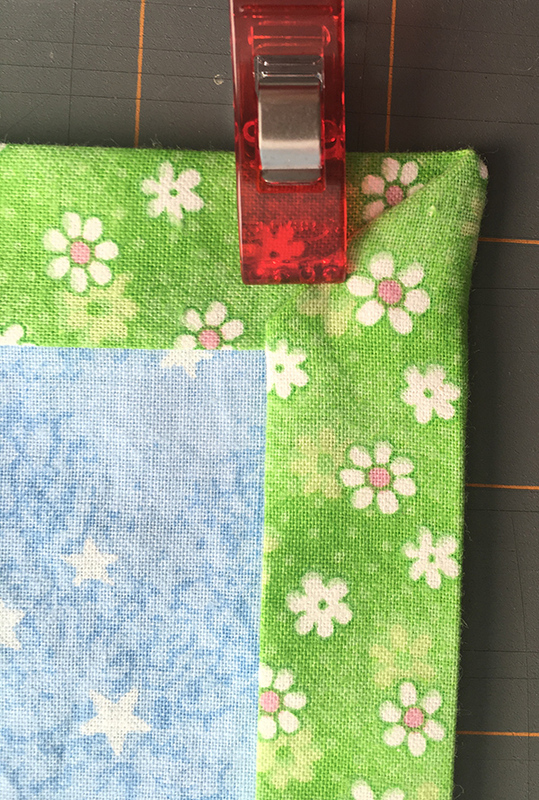 Sew close to the ¼” hem edge to create a pocket for your flag hanger to go through.